Littlehampton Liberal Democrats have called for the clock tower in the High Street to be kept in place if funding to revamp the town centre is secured. Arun District Council has bid for £2.5million from the Government’s Coastal Communities Fund (CCF), with a decision due this spring. James Walsh (LDem, Beach) called for the clock tower outside Sainsbury’s to stay put if the bid is successful and work does go ahead. He said a previous consultation on proposals had shown residents were against its removal although it could be moved a foot or two either way to improve sight lines. 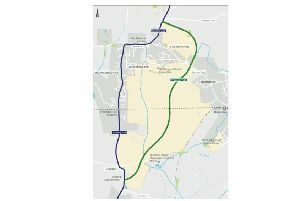 He asked for assurances from Arun District Council’s leader that these points would be ‘taken into account and acted upon’ at a meeting last Wednesday (March 14). Dr Walsh also pointed out that the clock tower belongs to the town council. Leader Gill Brown said she noted the concerns and they would be taken on board. If the funding bid is successful they would ‘talk about what happens afterwards’.